ODESSA, Ukraine -- The U.S. Air Forces in Europe jazz band has wrapped up a 10-day tour of Ukraine to mark 25 years of diplomatic relations between Washington and Kiev. Master Sgt. 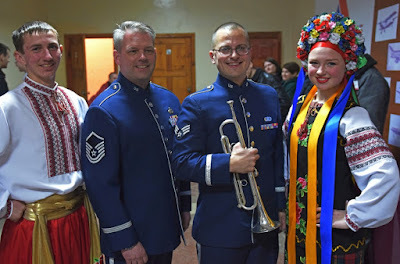 Dave Dell stands with two residents of Kropyvnytskyi, Ukraine, after the U.S. Air Forces in Europe jazz band performance, March 25, 2017. The band's tour of Ukraine ended April 2. The 14-member band, on its first trip to Ukraine since 2011, played large concerts in Odessa and Kiev and outreach events in surrounding communities. The group was invited by the U.S. Embassy in Kiev and orchestras there and in Odessa. “The Ukrainians have a deep appreciation for culture, and the American jazz that we’ve been performing while on tour has been very well-received,” Lt. Col. Don Schofield, USAFE band commander and conductor, said Thursday. The Ambassadors, as the group is known, returned home to Ramstein Air Base, Germany, on Sunday. One of its best receptions was at the Aviation Academy in Kropyvnytskyi before a crowd of more than 600. The school trains pilots, air crews and air traffic controllers. Before taking the stage, the airmen were treated to folk music and baked goods from Ukrainians wearing traditional dress. After the show, students from the academy invited band members to a spontaneous jam session. “We just started playing music together, and it was really fun,” saxophonist Staff Sgt. Brian Connelly said. Connelly added that they used the universal love of music to bridge differences with Ukrainians who may have never met Americans before. “We were able to cut right through the cultural barriers and immediately share our energy and our commitment through music,” Connelly said. During a small speaking engagement in Odessa band members fielded questions about their careers and American life. “They started asking us questions, like where do we shop and did we know about the Gap, because one had just opened in Odessa,” Connelly said. The USAFE band conducts concert tours in 104 countries throughout Europe and Africa. “In all of our travels we are building relationships, underscoring trust and respect and getting to know the people that we perform for,” Schofield said. Air Force bands support the service’s mission through performances for the U.S. military and at recruiting and community relations events. The USAFE Band traces its origins back to 1943 at Greenwood Army Air Field, Miss., where it was activated as the 386th Army Air Forces Band.